RockMeeting has uploaded quality video footage of Faroe Islands natives TÝR performing on October 14 in Toulouse, France as the support act for FINNTROLL. Check out the clips below. TÝR's seventh full-length album, "Valkyrja", was released on September 17 in North America (one day earlier internationally) via Metal Blade Records. . TÝR once again collaborated with Jacob Hansen at Hansen Studios in Ribe, Denmark. Along with Hansen, the band recruited acclaimed drummer George Kollias to act as studio drummer and LEAVES' EYES vocalist Liv Kristine joined vocalist/guitarist Heri Joensen for a vocal duet on "The Lay Of Our Love". 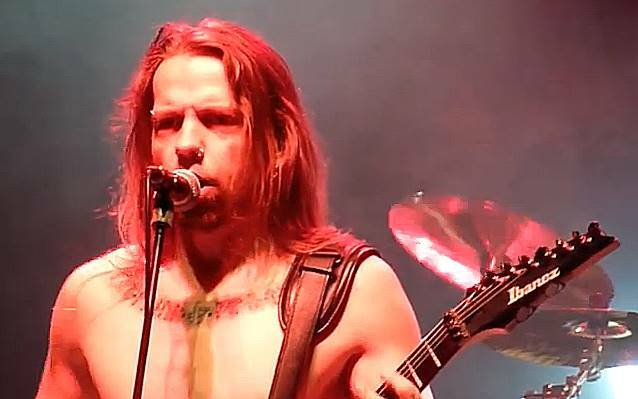 Amon Ellingsgaard is drumming for TÝR on the band's European tour with FINNTROLL. Amon is currently drummer for Joensen's side project HELJAREYGA. Many fans may already be familiar with Amon, who is also the nephew of former drummer Kari Streymoy, as he has filled in for TÝR before on the first Paganfest in 2008. "Valkyrja" is a concept album with a story line based loosely around an anonymous Viking age warrior who leaves his woman and goes off to impress the Valkyrie on the battlefield so that she may bring him to Valhalla, or to Fólkvangr, the home of Freyja — the goddess associated with love, sexuality, beauty, fertility, gold, sorcery, war, and death. One can say the album is also indirectly about women and how they affect men and what men will do to impress and obtain women. Joensen goes on to explain: "The woman that the warrior leaves may represent the earthly women. Freyja, The Lady Of The Slain, may represent the perfection of Women, and the Valkyrie is the link between the two, taking men from earthly to godly women."